Is Triumph Group Good Enough for You? 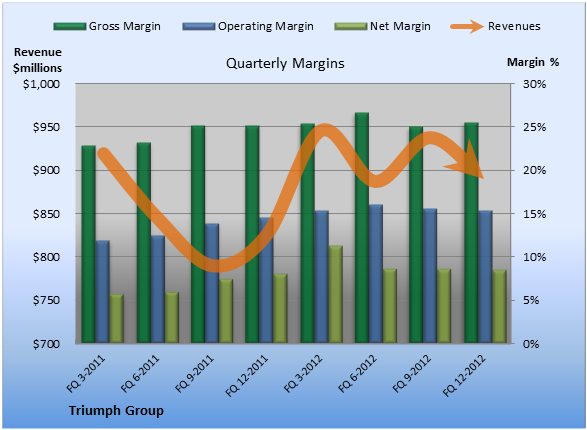 Here's the current margin snapshot for Triumph Group over the trailing 12 months: Gross margin is 25.6%, while operating margin is 15.6% and net margin is 9.2%. 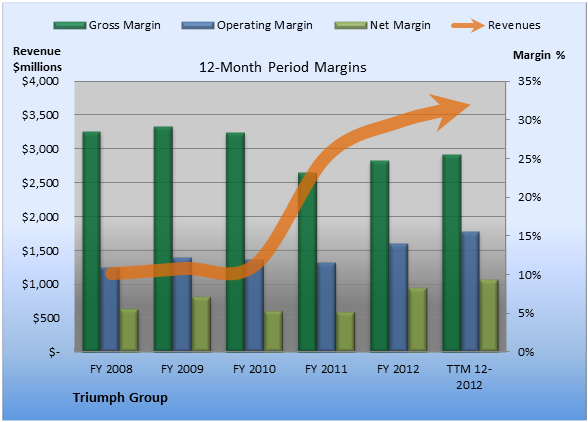 Over the past five years, gross margin peaked at 29.2% and averaged 26.8%. Operating margin peaked at 14.1% and averaged 12.2%. Net margin peaked at 8.2% and averaged 6.2%. TTM gross margin is 25.6%, 120 basis points worse than the five-year average. TTM operating margin is 15.6%, 340 basis points better than the five-year average. TTM net margin is 9.2%, 300 basis points better than the five-year average.